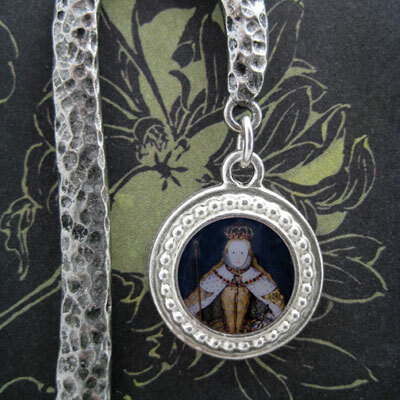 A distinctive bookmark featuring Elizabeth I's coronation portrait, just perfect for a Tudor history bookworm. Tartx bookmarks come packaged ready for gift giving and complete with a velvet bag for safe keeping. Choose between smooth finish antiqued pewter or Hammered style textured antiqued pewter. Mounting is Silver Plated Britannia Pewter approx. 20mm with a 12mm (1/2 inch) opening. The back of the mounting features an oxidized leaf design. All components are completely lead free.